The pastry is is a short crust pastry with cinnamon added to it. 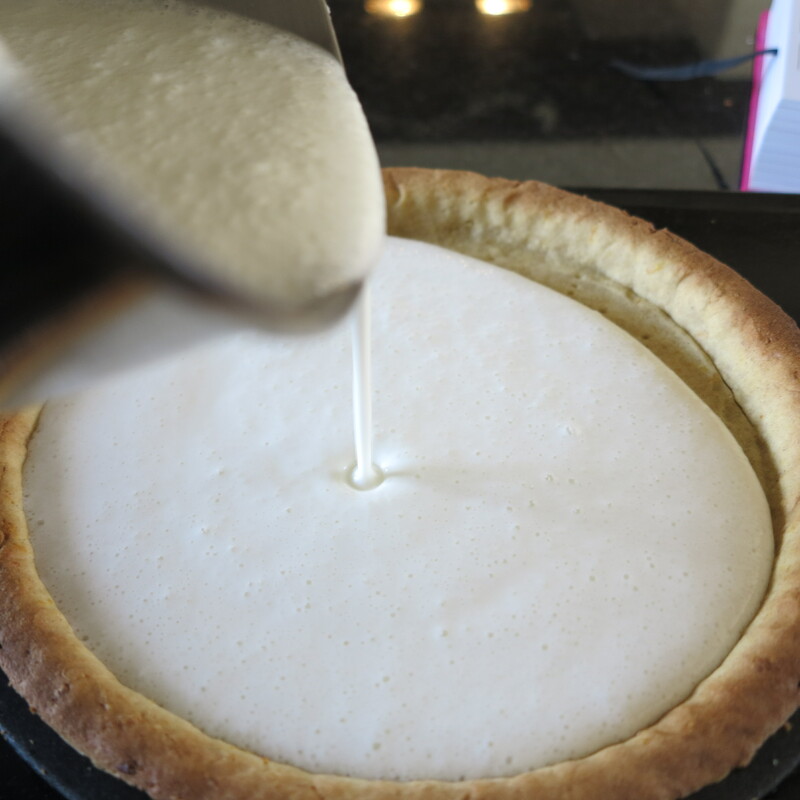 The filling was made by heating and gently whisking together together greek yogurt and milk until smooth. 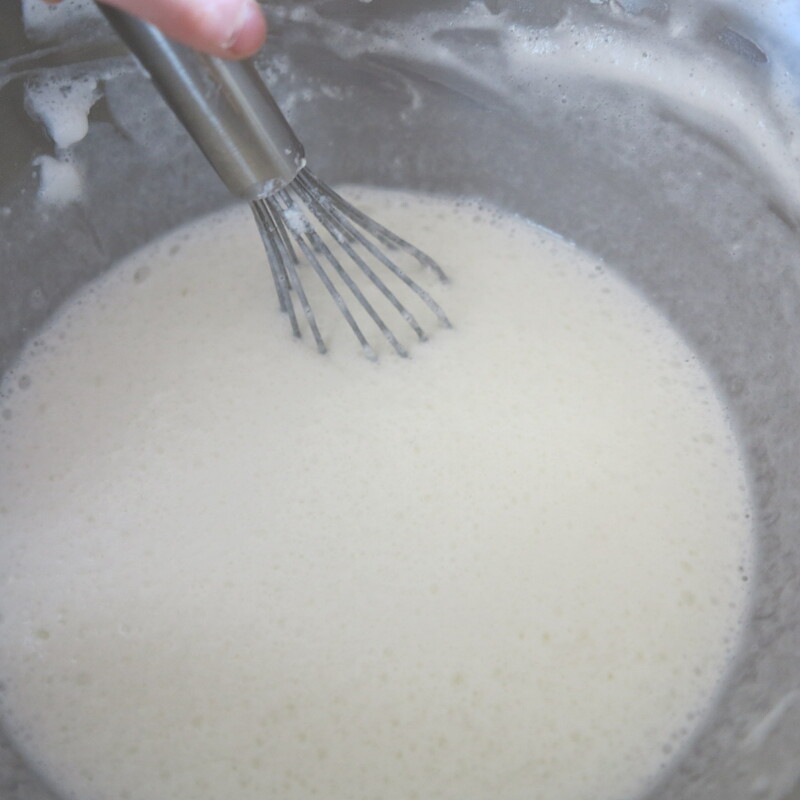 I then mixed together some cornflour and vanilla extract in a bowl and added a little bit of the warm milk mixture. This was then added to the milk mixture which was then bought to simmering point and whisked until the mixture thickened. A bit like making a custard. While the milk mixture was cooling I whisked together 4 egg whites and castor sugar into firm peaks and then gently folded it into the milk mixture. The mixture was then poured over the baked cinnamon short crust pastry and placed under the grill for a few minutes to give it a golden top. I would never have thought to add whipped egg white to make cheese cake filling and I think the egg whites were used make a thickening agent. The cheese cake filling had a tangy taste and I made a raspberry collis to go with it and make it taste sweeter unfortunately i forgot to take a photograph of the finished cheesecake and by the time I remembered it had all been eaten. This week I’m learning to make a sweet pastry and also some homemade lemon curd to put into the tart. I did think that making my own lemon curd would take a while but it was actually very easy and quick to make as well as tasting amazing. The pastry uses icing sugar, the seeds from a vanilla pod and ground almonds. At the beginning the pastry resembles a butter cream until you add the flour and then it starts to look like a pastry. Once the pastry has been made it is left to rest for two hours. While the pastry is resting I made up the lemon curd by placing lemon zest, lemon juice, butter, sugar and eggs in a saucepan over a gentle heat. I gently stirred the mixture until it started to thicken. If the heat is too high the mixture will become like scrambled eggs. When the curd has thickened place through a sieve and leave to cool. I also candied lemon slices by boiling sugar and water and placing sliced lemons into the the boiling water and letting the lemons simmer until the outside rind of the lemon is nearly clear. When the pastry had rested I rolled out and placed into a tart tin and baked for twenty minutes. 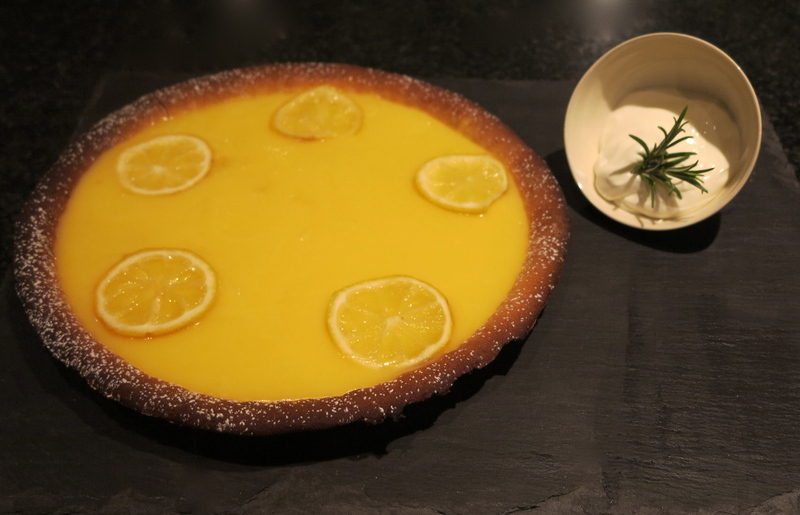 I left the tart to cool and then spread the curd over the pastry and placed the candied lemons on top for decoration. 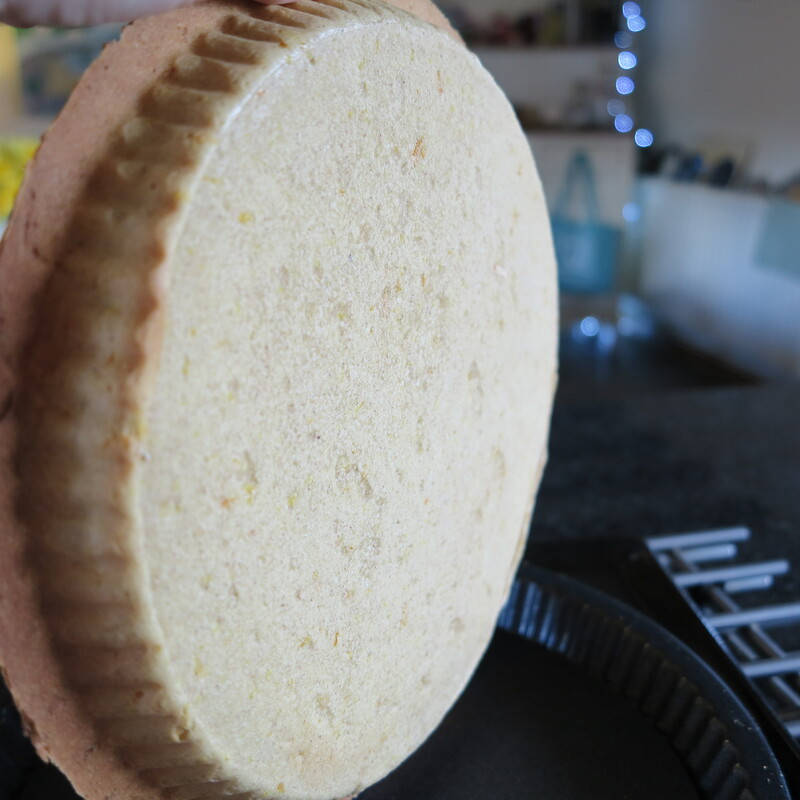 I then placed the tart in the fridge to set. This week not only did I learn a new pastry, how to make lemon curd and candy fruit but I also managed not to get a soggy bottom on my pastry. For this weeks pastry I made an upside down apple and rhubarb tart using a shortbread pastry. 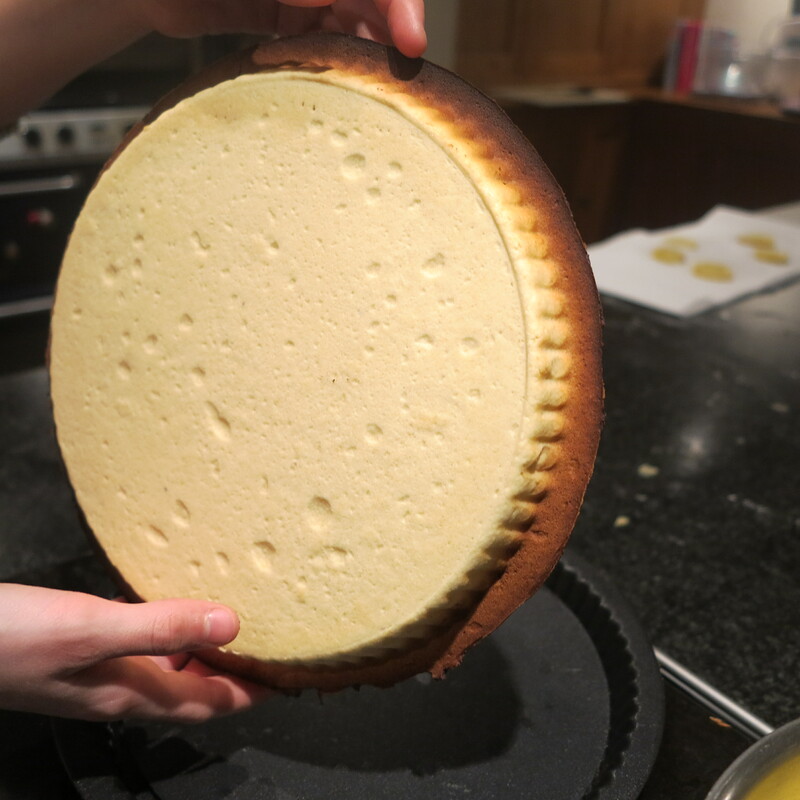 Mix together 3 egg yolks and 130g caster sugar until the mixture is thick then add 150g softened butter and mix till smooth finally add 200g plain flour, a pinch of salt and 10g baking powder to the mixture and beat until you have a smooth ball of dough. Cover the dough in cling film and chill in the fridge for 2 hours. Place 100g caster sugar and 3 tbsp water in a small saucepan and stir until the sugar has dissolved. Continue stirring until the mixture changes to a light amber colour. Pour the caramel evenly on to some baking parchment and leave to cool and harden. Peel, quarter and core 4 baking apples, and place in a oven proof skillet. Break the cooled caramel into pieces and place on to your apples. Pour over the apples half a juice of a orange and 1 tbs of melted butter. Cover the skillet tightly with tin foil and place in the oven and bake for 20 minutes or until the apples are soft. Now it’s time to put everything together. When the pastry has cooled spread the rhubarb compote onto the pastry base and then top with the caramelised apples. Melt a little apricot jam and spread onto to the apple. Lots of different techniques to learn this week. Next week my book concentrates on a chocolate pastry which is a small problem as I’ve given up chocolate for lent so I’m going to skip this till after Easter so next week I’m baking a lemon curd tart with a sweet pastry.